This time last year, Trader Joe’s introduced the Yellow Jackfruit Curry, prior to that they added canned jackfruit. So the options seem to be slowly expanding. Unlike cookie butter or cauliflower, there are lots of people who might be unfamiliar with jackfruit. While its called jackfruit it isn’t sweet, so don’t let the word fruit fool you. Some people compare the texture to a pulled pork. I’d agree with that assessment of the texture, but say the taste is closer to artichoke. Or at least in this application. The last time I had them, it was with curry so it was more of an assertive flavor. 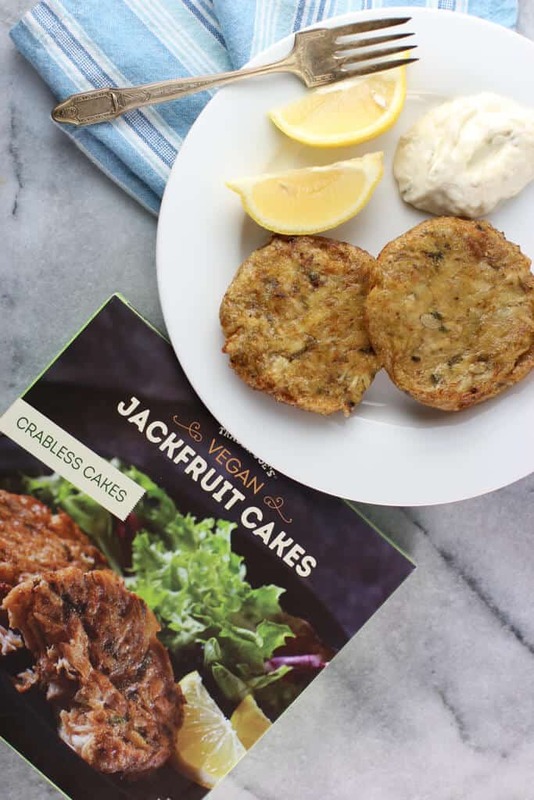 This however, seeks to be the meatless answer to Trader Joe’s Crab Cakes. These are also much cheaper. 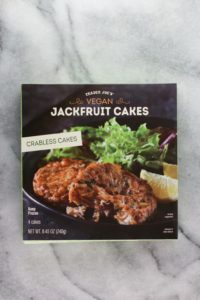 One box of two crab cakes would set you back $6.99, however this one box of vegan jackfruit cakes costs $3.99 and contains four cakes. And for a meatless solution it’s pretty good. But don’t expect this to taste like crab. Here you have the familiar elements of a crab cake: a breading and filling. I treated mine like crab cakes and enjoyed them the same way. They weren’t bad. And the package of four made for a filling meal with a reasonable calorie count. But there were a few differences. These seemed a bit greasy and they were a bit gummy in terms of the exterior. But as a substitute, for real crab cakes they did a good job mimicking the flavors. 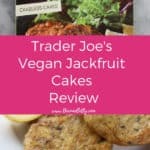 Based on the ingredients, these are not only vegan (which is labeled), but they seem to be gluten-free as well (which is not labeled as being such). Overall, not a bad option. 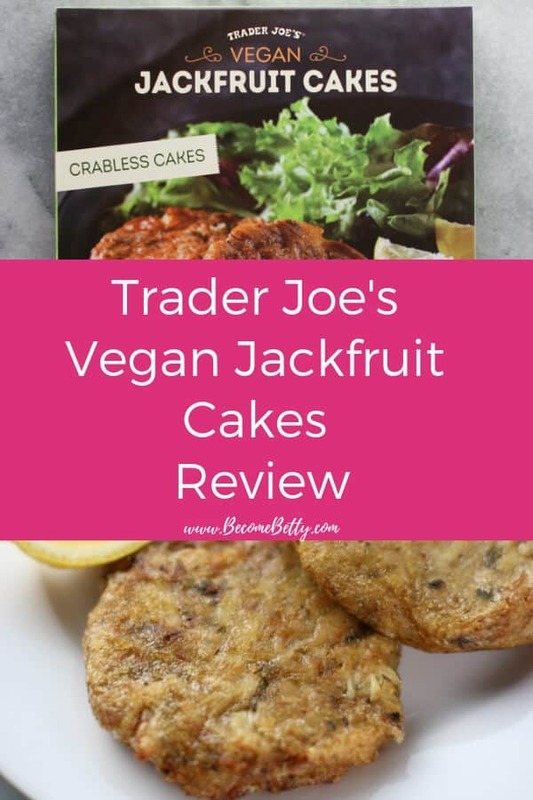 The taste isn’t crabby and if you go into it expecting more of an artichoke flavor, then you might enjoy these. It made for a nice meatless dinner. Would I buy this again? Yes, I’d buy this again, but I’d also buy the crab cakes too. Product Description: Trader Joe's Vegan Jackfruit Cakes that are basically crabless crab cakes. Vegan if that is important to you (and possibly gluten free as well. They are not labeled as being gluten free but a quick glance at the ingredients they look like they might be). Glad to see your description of jackfruit. There were some in the grocery store a couple of months ago, but I had no idea what to do with it, so didn’t purchase. Thanks for the explanation – very helpful. just can’t seem to get into this Jackfruit craze I have tried them in a curry but not being a vegan or vegetarian I prefer some other form of protein. 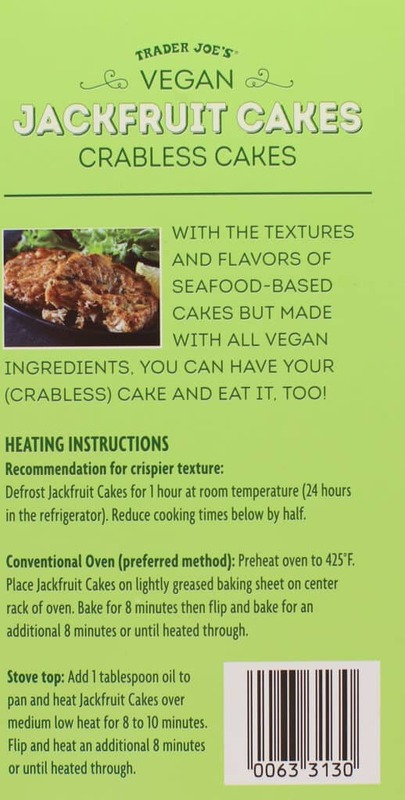 Honestly I find a kind of ridiculous to call them crabless cakes. They shouldn’t even compare them or even hint that they could taste like crab. These are probably not for me but I may end up trying them just out of curiosity and based on your review. Thanks for reviewing a wide variety of products. Hey Dag! It’s not a must try, I just had to satisfy my own curiosity. I paired it with the same thing I would pair crab cakes with, so its passable, but wouldn’t fool anyone. Thanks again for always stopping by and sharing your thoughts! I think these would make a great sandwich! Spread that vegan mayo mixed with some finely chopped pickles on a roll and some lettuce on it. I’m excited to try these! Maybe after cooking in a pan they should be put on a paper towel to absorb any extra oil? I bet they would be great ontop of a salad too. Thanks for the heads-up on this one! I will definitely have to try it! Just tried these the other night. The taste was good, not spot on but definitely in the realm of crab cake. However the texture was off for me. The “breading” was gummy and then the large chunks of jackfruit were tough and hard to chew in contrast. The two textures just didn’t work well in my opinion. Overall they were pretty oily as well. Hey Katharine! I noticed the greasiness right away. I put mine on a paper towel the same way I would with fried food. It seemed to do the trick, but I had the same issue with the gummy outside. Thanks so much for taking the time out of your day to stop by and share! Do you think the nutrition data is accurate? 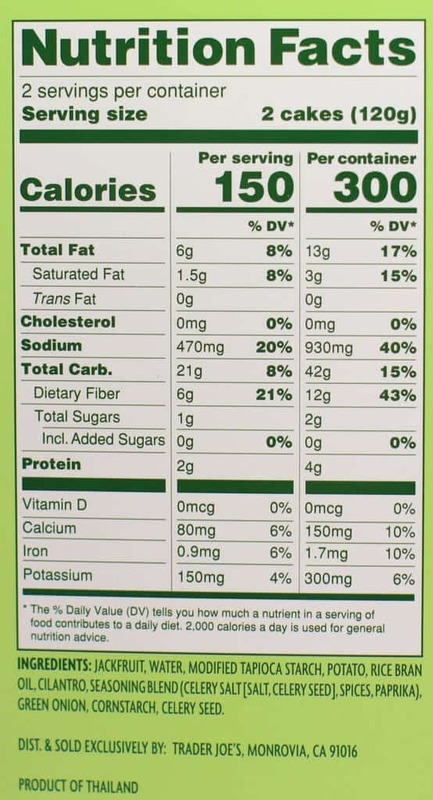 I wouldn’t be surprised if they have double the fat and calories as listed. They come out nicely using an air fryer but still very oily. Hey Nancy! To be honest, I have no idea. I have no way of testing that out at home either. Place them on a paper towel afterwards to absorb the grease. I wish I could help more! Hey theculinarybotanist! Thanks for sharing that tidbit about the hearts of palm in place of the jackfruit.Good to know! Thanks for stopping by! Hey Randal! Thanks for stopping by and sharing your thoughts on this.